Above: Bumblebee foraging on Beach Aster. Beach aster can thrive in a range of conditions, including dry, sandy soil, and can tolerate exposed, coastal sites. 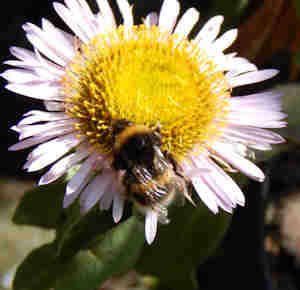 There are plants that attract bees, even in difficult gardening conditions. And certainly, it has to be said, some people really do have gardens which represent a real challenge! 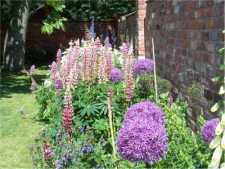 Clay soil, drought and shade (not to mention combinations of any of these) may seem like impossible gardening scenarios – yet even here it is possible to accommodate a few plants that attract bees. Rather than attempting to ‘solve a problem’ by changing your conditions, I tend to think it is better to work with nature. If nature can create certain conditions of soil, weather or light, it will have created life that can thrive in that habitat! Many herbs, wildflowers, succulents and other garden plants will thrive in drought areas. Take a look at these great drought plants that attract not only bees but also other pollinators. Oh, and a drought garden does not need to be boring! Here you'll find some shade gardening ideas that include planting for bees and pollinators! I once had a garden that had clay soil. Clay soil can be very challenging and a lot of hard work, but even here you may be able to grow plants for pollinators! Here you'll find some great tips about how to create a garden that will attract bees, butterflies and other pollinators. It need not cost a fortune to create your bee garden. Take a look at these tips for getting free (or nearly free) garden plants! 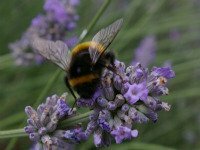 Discover how plants are pollinated, and the importance of bees and other pollinating insects. Here, you'll also find links to further information about wind and self pollination.